When you think about moving, the first thing that probably comes to mind is packing up clothes, kitchenware and other personal belongings. But not all moves involve a home. Businesses and other organizations need to relocate from time to time too. Recently, we began helping the Fredericksburg Area Museum and Cultural Center move its collection of historical artifacts to its new home in Fredericksburg’s historic town hall building. Even though the move was just a couple of blocks down the road, moving these extremely delicate (and sometimes large) items in a bustling area of town was no easy feat. A team of five (one driver, one project manager and three movers) worked with the museum’s executive director, Sara Poore, to develop the best plan of action for moving the museum’s collection. An architectural arch from a home in King George County dating back to 1790. The arch’s original coat of paint is still intact. A Spanish olive jar ca. 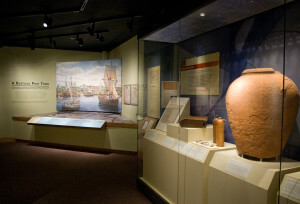 1745-1780, used to store water, wine and a variety of foods when they were shipped overseas from Spain to the Americas. In any situation involving historic items, which can be easily damaged, it is extremely important to work with the experts to ensure that each piece is handled properly. In most cases, gloves are used by our movers to protect historic artifacts from damage that can be caused from the transfer of the oils on one’s hands. There are however exceptions to the rule, such as when the use of gloves does not allow for a secure grip on large, heavy items. Our team worked closely with museum staff to ensure that we were handling every item with the utmost care. The first two phases of the museum move are complete and the final phase – moving the large part of the collection currently being held in storage – will be completed soon. When the museum reopens it will include an open collection storage space, making it easy for visitors to see more of the items from Fredericksburg’s history!